They don’t actually put up with this. The unicorn herds of Kadia have recently begun to play an important role in the campaign… So here we have how they came to Kadia – or at least how they would say that they did. “Truth” is elusive with the fey. The past is a lie. A thing of myth, of legend drawn from a thousand threads. A common foundation, that ties together then myriad worlds of the Manifold in the bedrock of human consciousness. Behind a thousand masks, ancient archetypes and tales are embodied. Reborn and fitted to new narratives, worlds, and embodiments. The dragons had flowed down from the hills, the malevolent incarnations of a volcanic storm. Herdmaster Lyas led his adolescent sons – including young Kirsyan – into battle, to cover the herds flight. The herd guardians took up their stations around the mares and foals, to protect them as they fled. The dowager mares fed their powers of healing and endurance to the herd guardians. The younger mares fed their power to the foals, to give them strength to flee beyond what their small bodies contained – even as the pre-adolescent boys focused their tiny offensive powers ahead, to clear a path of escape while their young sisters supported them. The Herdmaster fell, carving out a gap in the oncoming fires. His sons fought more frantically, both to break the storm and to be the best, the leader and victor who would succeed – if they and the herd survived – their fallen father as Herdmaster. Some, their talents insufficient, fell. Others fled or hid, and lived. Kirsyan… held, leading two of his brothers to emerge as the fires passed. He gave pursuit, draining the strength of the now-split dragon-storm further with bursts of ice even as it approached the fleeing herd and struck the defensive barriers of the Herd Guardians. Many of the guardians, supported by the strength of the mares far beyond the point of terminal burnout, fell – and some elder mares, too exhausted to survive, fell with the guardians that they had supported to the end. But, aided by Kirsyan and his brothers frantic efforts, the massed barriers held. The herd, through the foals and their young mothers, lived on. Kirsyan claimed the herdmastery – and replaced the fallen guardians with those of his surviving adolescent brothers who had been cowardly or who had performed poorly in battle on the spot. The two brothers who had followed his lead and stood by him received some of the Mares, Foals, and Guardians, splitting off their own herds and leaving to re-colonize areas once held by fallen herds. The ancient pattern continued, as the diminished herd struggled to rebuild, to grow strong before the next, inevitable, disaster befell. And then a young – but impressively powerful – shaper of worlds arose, creating a world… of vast scale and benevolence, if of curious rules. And with a place for Unicorns in it, and natural laws that allowed them to… recruit humans to fill the ranks of the herd. Kirsyan seized the chance, and wove the narrative of his herd into the forming world – becoming a long-standing part of a past which mere hours ago had not been. For this is the tale as it was in Kadia, in a history which never was, but yet lives and breathes. Such is the mystery of the fey. I would have just said “friendship is magic,” but your way works too. 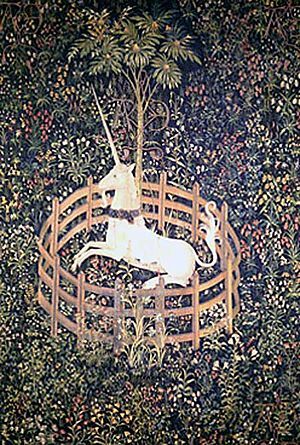 For good or ill… Kadian unicorn herds may look rather idyllic – but they’re the most militarized society in the entire dimension short of the bees and ants, are rather ruthless, and are not at all G-rated. After all, they survive in the wilds in some very dangerous areas.